The MINI Countryman is the biggest MINI ever made, with its noticeable silver roof bars, plastic sill and wheel mouldings and large wheelbase this is unmistakably MINI’s daring take on the crossover. 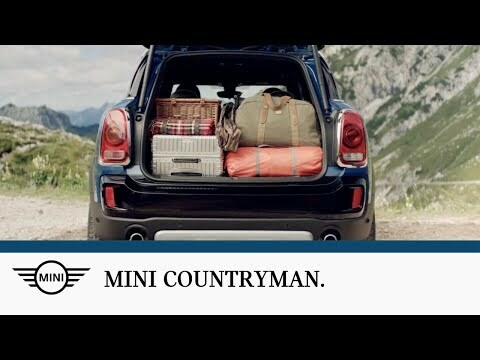 You could not, however, mistake the Countryman for anything other than pure MINI. With new styling features inside and out the new Countryman takes over from the older model that has been exploring MINI adventures for 6 years. The new evolution of the Countryman offers higher quality finishes nodding to BMW but still retains its MINI-NESS with the classic MINI grille and the 3 window profile although the rear windows are somewhat bigger. The new Countryman has a little more ruggedness about it and with the top of the range SD All4 version it would not look out of place roaring up a mountain. On the inside, the classic MINI touches are still there with the large circular centre screen and instrument cluster there are now rectangular air vents instead of the classic round ones. The quality of the interior has also been made more upmarket and can be personalised with split colour door trims finished in quilted leather. There is ample legroom in the rear because of the longer wheelbase and the Countryman has more than enough room for 5, this is topped off with a more than generous boot which also has nifty picnic bench that lays across the tailgate if you fancy stopping anywhere. There are endless options in the Countryman with interior illumination, top grain leather and electric seat adjustment.The MINI Countryman is the perfect family car for the city and also when you want to get away for the weekend into the wilds. It offers superb handling and top quality comfort. Topping it all off the Countryman is packed full of technology for your safety including optional Run-flat tyres, Hill start assist, Forward collision warning system, City collision mitigation system to name a few which makes this MINI ideal for family school runs or your very own MINI adventure into the wilds. Contact Douglas Park today to arrange your test drive.